RBTH presents a selection of views from leading Russian media on the latest developments in Ukraine, featuring analysis of the results of Ukrainian President Petro Poroshenko’s visit to the U.S., continuing disputes in Kiev over the status of Lugansk and Donetsk, and Poroshenko’s appointment of a new head of the Lugansk Region’s administration. Moskovsky Komsomolets writes that Ukrainian President Petro Poroshenko was not able to reach an agreement with his American counterpart Barack Obama on the supply of heavy weaponry to Ukraine and on granting Ukraine special status as a non-NATO American ally. The Ukrainian President commented on the refusal in the following manner: "Obama has said 'no,' since we already have a special status. The level of cooperation between the U.S. and Ukraine on matters of security and defense is much higher than the one required by the status of a principal non-NATO ally." However, Moskovsky Komsomolets believes that Poroshenko's optimistic tone is just an attempt to “sweeten the pill." Meanwhile, the newspaper reports that Poroshenko, in his own words, was satisfied with his visit to the U.S., "despite the fact that not all his plans were realized." Commenting on Poroshenko's visit to the U.S. and his speech in Congress, Kommersant writes that the Ukrainian leader's main objective was to increase the volume of American aid to Ukraine, first and foremost military aid. Kiev believes that the aid the U.S. has already given ($60 million to support the army) is insufficient. According to the newspaper, in the course of the discussions, Ukrainian diplomats cited the example of Georgia, which after the 2008 war received more than $1 billion from the U.S. for the reconstruction of its economy. 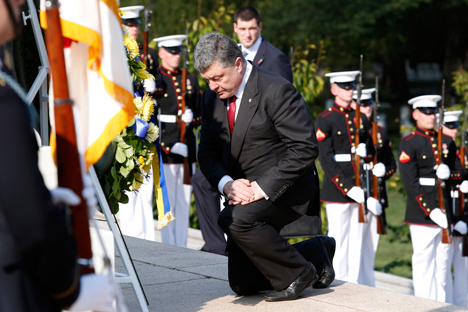 Recently, there have been periodic calls in Washington to strengthen the Ukrainian army. In particular, Kommersant quotes Carl Levin, Chairman of the U.S. Senate Committee on Armed Services: "Russia's aggression will become overwhelming, if we do not supply Kiev with ammunition, anti-tank systems and missiles." However, the White House's official position remains unchanged: The main instrument with which to pressure Russia will be the economic sanctions. The principal aim in the discussions between Poroshenko and the American representatives was to demonstrate the West's support for Ukraine. Yet, according to Kommersant, there have not been any key improvements in terms of financial and military aid. Meanwhile, arguments are still raging in Ukraine about the law introduced on September 17 granting Lugansk and Donetsk, which are controlled by the militias, special status. Nezavisimaya Gazeta writes that politicians loyal to Poroshenko say that the law is a necessity and in no way signifies concessions to the pro-autonomy militants. Advisor to the Ukrainian President Ihor Hryniv said that "the decentralization will not be carried out in the entire region, but only regarding certain organs of the local government." He also remarked that the maximum "special status" period that the law grants is three years. More radical Ukrainian deputies are unhappy about the law, as well as about the fact that, according to the law, it will be the representatives of the presidential security service that will determine which territories will receive "special status," and not Ukraine's parliament, the Verkhovnaya Rada. A group of deputies have even presented a bill about the annulment of presidential laws. Nezavisimaya Gazeta cites Kiev political analyst Vitaly Bal, who is certain that the current situation is only a temporary compromise and that Poroshenko signed the Minsk agreements "in order not to disrupt the parliamentary elections," while in fact the Donbass problem is far from being resolved. On Thursday Poroshenko signed a decree, appointing Hennadiy Moskal, a deputy from the Batkivschyna party, as head of the Lugansk Region administration. Moskal has already announced that he intends to immediately fly out to Lugansk in order to start administrating the region. Gazeta.ru explains that actually the newly groomed governor will only be able to administrate the part of the Lugansk Region that is not controlled by the self-proclaimed Lugansk People's Republic, and that his residence will not be in Lugansk itself (which is also controlled by the militias), but in Severodonetsk, 60 miles away. Gazeta.ru cites Director of the Russian-Ukrainian Information Center Oleg Bondarenko, who believes that "Moskal is a hawk, a man from the ‘war party’, and his appointment is Kiev's attempt to demonstrate that the region is under control, which is not exactly true."